A bit of truth before we start. I used to be fat. Now when I say fat, I mean overweight for my age/height. Not P.H.A.T., which would be cooler. 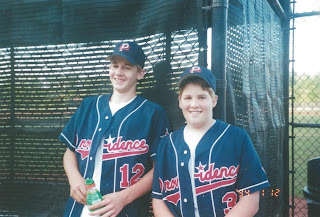 In the 9th grade I was about 5'4'' and 170 lbs. Chunky, for lack of a better term (See picture below for reference). Up until my fateful 9th grade year I was very confident in my athletic abilities. Growing up I played just about every sport a boy in Atlanta could. Baseball, basketball, soccer, golf, street hockey, flag football (no real football at my school). If there was a projectile object and any sort of goal, I was playing. Then came JV basketball tryouts. We had a good team the year before, and returned nearly all the starters. There were just enough open spots for about six 9th graders to make the team. I had always fancied myself one of the best athletes in the grade (despite my stature, speed and pudginess). In my mind there was no way that I would fall behind the 6 other classmates and not make the team. I was wrong. I went into the coach's office and was told, in no uncertain terms, that my general body shape was not going to be an asset on the basketball court. I was crushed. Having not made the basketball team and watching Greg Maddux dominate yet another year, I made up my mind that there was only one sport out there for me. Baseball! I watched the NFL and the NBA. It fascinated me how fast they were and how high they could jump. Watching Michael Jordan was a treat, but I knew that I would never be able to dunk from the foul line (or any line). But David Wells, Greg Maddux, John Wetteland, these guys were shaped like me and they were playing in the Major Leagues. My mind was made up. From that point on, no matter how my body grew and molded itself, I was committed to my one sport. Spring, Summer, Fall I was going to be playing baseball and in the Winter I was going to be wishing for Spring again. I did grow, eight inches to be exact, from 10th - 12th grade. As I got taller my body relocated some of the love handles...but not all of it. Even after receiving a scholarship to play baseball at Berry College, I was labeled a "soft body" guy. I had a loose arm, a good curveball and repeatable mechanics, but compared to most of the other guys on the team I looked like a chubby kid. Stepping on campus at Berry, the disparity only increased. One after another, my teammates would get in the weight room and throw so much weight on the bench press and squat rack that the bars would bend. Then I got up there and spent 5 minutes taking all the weight off just so that I could lift it off the rack. I was a "soft body", but I could flat out pitch. Going into my second and third years of school I was determined to redistribute more of the spare tire around my waist in an effort to look the part. I worked hard in the weight room. I did all of the prescribed running, and more. Coming into the spring season of my junior year I was in the best shape of my life. Not an Adonis like some of the other guys, but still not bad. I expected my pitching to follow suit. I was wrong. Between getting lit up at times, having control issues, and developing tendonitis my year wasn't turning out the way I had imagined it would all those days staring into the weight room mirror. My goal to become a "hard body" guy had ended up hurting my performance. Not only was I still soft around the middle, but I was riding the pine because of injury and overuse. It was frustrating, because I still saw the same "soft body" guys doing it every 5th day all summer in the MLB. I got drafted (by the grace of God) and began working my way through the organization. Strength training was a mandatory thing, but the routine you chose was more personalized than ever before. I could choose whether or not to bench press or do bicep curls. I could focus on mechanics and stretching and maintenance over muscle building. Still the pressure was there from organizational higher ups and the rumor mill that being a "soft body" guy didn't do much for your prospect status. You look at the top prospects from most teams and they look like men. Big, strong, fast, ripped. These guys might be uncoordinated and undisciplined but they sure could fool you into believing they weren't. I read (yes, I read) article after article describing myself and guys like me as dime-a-dozen righties with "soft bodies" and not much of a future. It kinda pissed me off. Just because I was a little pudgy and couldn't throw 100 mph didn't mean you could just write me off as a "long shot at best". I began to use this frustration as a competitive edge. I had figured out what my body needed to perform at its highest level without breaking down. It might not be the most athletic looking body in the world, but I was going to prove that it could to be effective. I threw 130+ innings last year. Almost 160 this year. I didn't miss a start due to injury. My body didn't break down. I also didn't win a marathon, break any world dead lift records, or steal any bases. I also wasn't beaten to the bag by a runner while covering first base. You see, my "soft body" used to be a stumbling block to getting where I ultimately wanted to go. Some people would claim that it still is, that my chances would be better if I wasn't so fat. They're wrong. God created me with a certain type of body. One that might never show a 6 pack and might always have love handles. But that body is also the one He will use to get me to the big leagues. To keep me healthy and flexible. To keep me one step in front of the runner when covering first. We come in all shapes and sizes. That's why I love Baseball! None of us have to look or act or pitch or hit exactly the same, but in the end we all have the same goal. Have fun. Win or Lose. Repeat. Love it, Collin. Hope you pitch the hell out of the Spring so we can see you at Citi this Summer. Colin: I had the pleasure of seeing you pitch this summer in Binghampton. You beat Altoona 3-1 in late Aug. 6 solid no run innings. Jose Reyes (Remember him?) hit a HR. Sitting behind home plate I took stills of you and my 14 year old son shot movies. If you want to see any let me know. I was glad you weren't taken in the rule 5 and I can see you in NY sometime by 2013 for good. Keep up the good work. We will be watching and following. I found this article through Toby Hyde's blog. I haven't enjoyed a sports article this much in, well, I don't know how long. I hope you have a very successful season, and by His grace, are pitching in Citi by 2013. Thanks for all of your well wishes and comments! The fact that people want to read about me and my baseball adventures (including childhood obesity) is crazy to me. But I appreciate it all so much. Look forward to seeing y'all at Citi in the near future! Colin, Hope you make a lot of progress this year and have a wonderful season! Congratulations on another great pitching performance last night. I am enjoying watching you succeed at AAA. Keep learning, keep growing, keep your head up and your pitches down. This pitch is update for baseball game.We also need update best softball bats for best baseball game.Every baseball player care that.Thanks for this post. Thanks for that, it was very good. I like to watch you succeed at AAA. Learn more, keep your head and lower the volume.